The Ssejinja Children´s Foundation works with community members and leaders to bring help to Uganda's orphaned and desperate children. 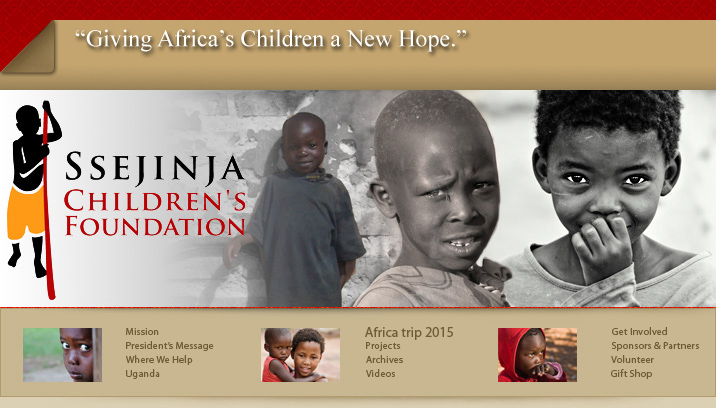 Our mission is to bring a new hope to these children by helping to meet their basic needs. Staggering numbers of Ugandan children have been orphaned by war and the HIV/AIDS pandemic that is sweeping Africa. Many of these children are struck by tragedy at a very early age and are left to raise themselves and their siblings. Often survival acts as as the dominant factor in their lives, pushing their futures and education out of the picture. In order for these children to have a chance to do more with their lives than simply cling to life, the must have, among the necessities of life, the basic tools of education. Pens, pencils, paper and books can change the face of a nation one child at a time. The Ssejinja Children´s Foundation has been successful in providing many of these tools for many children, but there is still so much to be done, and so many children that we have not been able to help. In the village of Bira, the foundation has put up a schoolhouse that serves both as classroom and shelter to many hundreds of children. Items from pencils to toothbrushes have been donated by many generous individuals and are being used right now to improve the lives of many children. Nevertheless, these children still need other important basic needs, such as clean drinking water and a blanket or a mat to sleep on. You can help provide these children with a place to sleep, a well from which to drink and a book to read. Together, we can make a difference, one child at a time.